Mayo Ideas Week 2018 takes place from Saturday, 22nd September to Monday 1st October 2018. 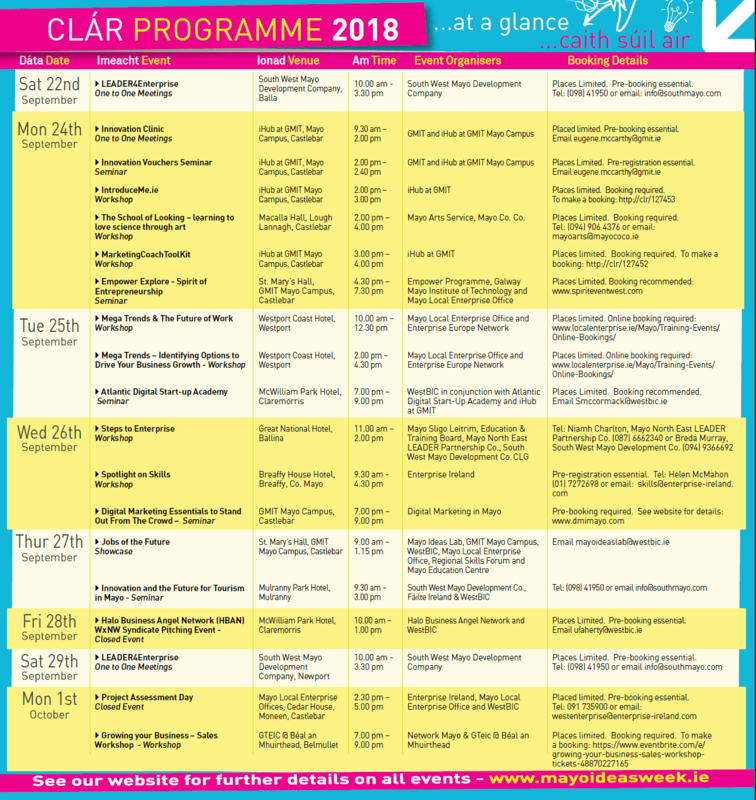 There’s a fantastic programme of events scheduled for around the country and you can see a full programme below or here. This short seminar will introduce the MET Technology Gateway and the expertise available to companies in GMIT. It will also provide an overview of the Enterprise Ireland Innovation Voucher process and other innovation supports throughout the Technology Gateway Network. Companies attending the event will gain advice on how to apply and how working with us through the Voucher scheme can help them advance R&D activities. IntroduceMe.ie offers outsourced business development solutions along with a professional business introductory service. They generate sales for Small-Medium Enterprises (SMEs), Self-Owner Businesses and Entrepreneurs – assisting their growth or expansion strategies. This one hour focused workshop presented by Claire Scanlon will showcase IntroduceMe.ie and how you can leverage this service to help grow your business. This event may be of interest to gain an understanding of online sales platforms. Marketing Coach Toolkit is an online tool that helps business owners create an expertly guided marketing strategy for their business. The Marketing Coach Toolkit takes entrepreneurs through a relatively short series of questions online, and turns these answers into a one-page Marketing Strategy. Their ideas are harnessed into a structured layout to give them clarity. The entrepreneur then receives a 1:1 coaching call to ensure that they have a clear marketing action plan i.e. identify the key steps they need to take to get more customers. This is ideal for business owners who are just starting out or diversifying their business. This simple, online tool can be really useful for people who need help in clarifying whom to target, how to target them and gives a concise plan of action to help them grow customers and sales! This event may be of interest to those interested in marketing automation and online marketing planning tools. Everyone is welcome at the annual Spirit event. Listen to some thought-provoking speakers and enterprise leaders. This is a chance as part of Mayo Ideas Week 2018 to engage and learn from some high profile female entrepreneurs in Ireland and a chance to connect and network with fellow entrepreneurs. The MC for the evening is journalist and broadcaster Carol Coleman. Hosted by: Empower Programme with GMIT Mayo Campus and Mayo Local Enterprise Office.